P100 Powder Cloud Air Flow "Smoke" with Borozin Powder for airflow studies. The P100 Powder Cloud Air Flow Detection System creates viewable clouds of fine white powder for studying low-velocity airflow in all types of smoke-trail visulaization tests. A high-quality rubber squeeze bulb gives a burst of air through the bottom of the P200 Powder Bottle. Quickly squeeze the bulb one or more times to create a cloud of appropriate size and density to conduct your airflow studies. 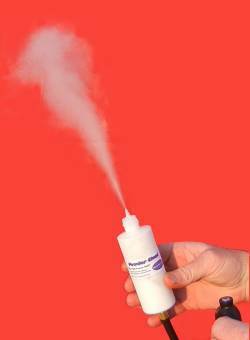 Perfect for determining directional flow and velocity of air from ductwork, clean rooms, hospital AFB isolation rooms, smoke-trail visualization tests and more. Our proprietary formulation of highly micronized, white Borozin Powder (Zinc Stearate) carries on air just like smoke. It offers high visibility, great hang time and virtually no residue. Eco-friendly, non-toxic, odorless, non-corrosive. The P100 Powder Cloud system includes a zippered carry case, instructions, one squeeze bulb and one pre-filled powder bottle that will provide hundreds of puffs of dense white clouds for your air flow tests. - P200 Replacement powder bottles are sold separately. See below.